Many people get into the habit of letting the bench press dominate their workout, but concentrating on your pecs at the expense of your back can lead to a muscle imbalance that not only looks rubbish, but also increases your risk of injury. 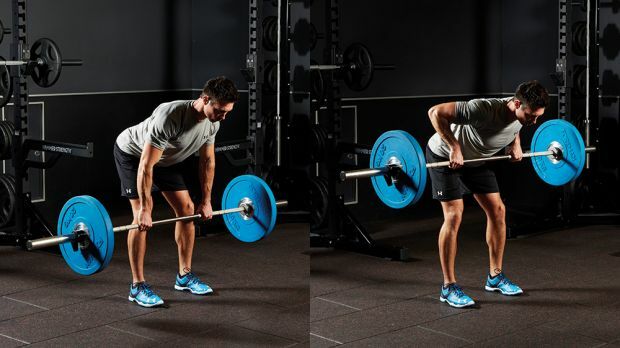 The bent-over row works the opposite muscle group, the upper back (traps, lats, rhomboids and rear deltoids), as well as your biceps and abs, which help keep your torso stable. Start with your core braced, your back straight and your shoulder blades retracted. Bend your knees slightly and lean forwards from the hips. Grip the bar with your hands just wider than shoulder-width apart, letting the bar hang at knee level. Pull the bar to your sternum, retracting your shoulder blades to allow the bar to come up to your chest, then lower slowly back to the start. Stand holding a heavy dumbbell in each hand with a neutral grip (palms facing), keeping your core braced and a natural arch in your back. Shrug your shoulders up towards your ears, keeping your arms straight. 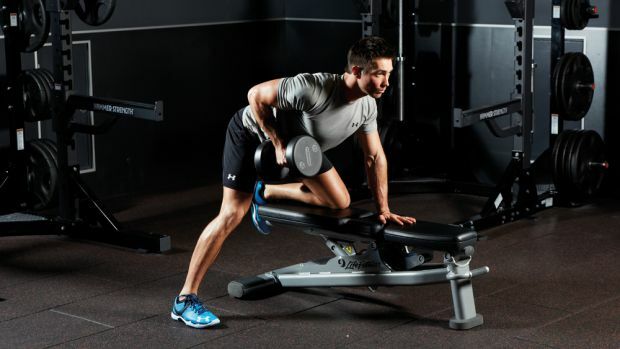 Hold for a second at the top position, then slowly lower the weights back to the start. You can also perform shrugs with a heavy barbell using an overhand grip just outside your hips. Working one arm at a time encourages balanced growth, lessening the risk of injury. Rest your left knee and hand on a bench, and hold a dumbbell in your right hand close to the floor. 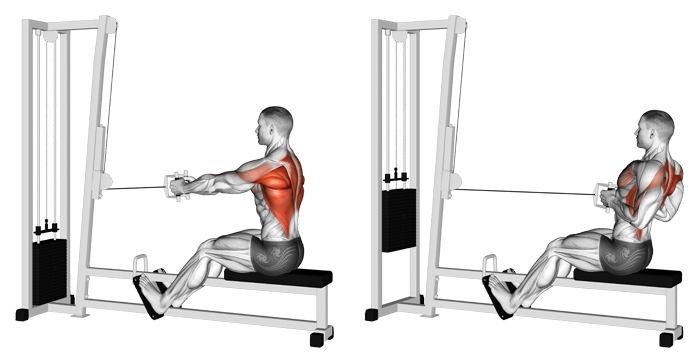 Keeping your back straight, use your back muscles and biceps to row the weight up to your side, leading with your elbow. 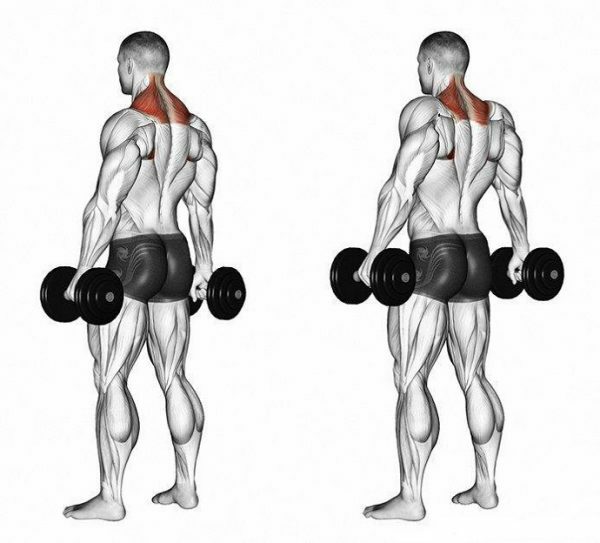 Normally you’ll complete all your reps with one arm, then repeat on the other side. Hitting your back muscles while seated allows you to go heavier and focus all your efforts on the target muscle groups, resulting in big muscle-mass gains. Sit with a flat back and a slight bend in your knees, using a neutral grip to hold a double-D handle attached to the bottom pulley of a cable machine. Ensure that there is tension in the cable before you begin. Pull the handle to your sternum, keeping upper-body movement to a minimum, and squeeze your shoulders together. Return slowly to the start. 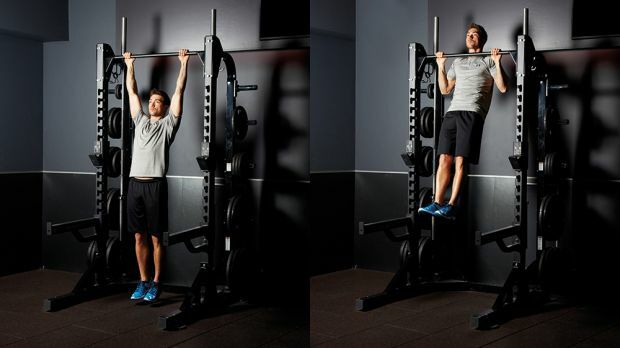 The best bodyweight upper-back exercise going, the pull-up works the lats, traps and rhomboids, as well as challenging your arms and shoulders. It’s a daunting exercise the first time you do it, and you might only manage a couple if you don’t use a resistance band or pull-up machine to support some of your weight, but stick at it and you’ll find that it won’t take long before you can knock out a set of ten pull-ups. Jump up and grab the bar in an overhand grip with your hands shoulder-width apart. Let your body hang so your arms are fully extended. Keeping your shoulders back and your core engaged, raise your body until your chin is above the bar. Then slowly lower yourself back to the start.